His parents did everything they could to see that their son had tools to make his way in the world. His father paid a week’s wages at the sawmill where he worked for a phonograph and 50 records. Watson earned the money for his first mail order guitar by cutting trees on his father’s farm. He played on street corners and with dance bands until he was “discovered” by a Smithsonian folklorist who was looking for another musician in the ’60’s. 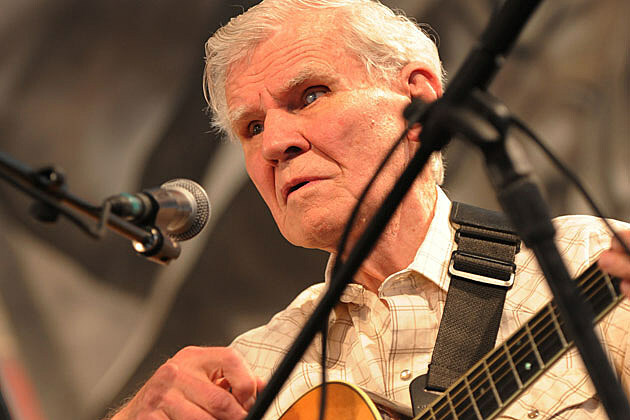 Since then, Doc Watson has given his own unique take on bluegrass and mountain music to the entire world. He died today, after surgery a week ago. There will never be another musician like him. Here is a great rendition of “Shady Grove,” one of my all time favorite bluegrass pieces, by Doc Watson, David Grisman, and David Holt. This entry was posted in Culture, Music and tagged 2012, Culture, Music. Bookmark the permalink. Nice music and nice tribute. Thanks. You’re welcome. Thanks for reading and listening. I heard a portion of an earlier interview on NPR this morning too, which was nice. I have nominated you for the “Tell Me About Yourself” award. Congratulations! For further details, please refer to my blog. Best regards, Mary Ann. Thanks – I will do so.